Like many young people, Mui Chin Nam only seriously pondered his career in his second year in university. He knew he didn't like the idea of a routine job, and wanted a career that allowed him to extend help to people. "With my career objectives in mind, I contemplated a career in the civil service and found a mid-term scholarship with the Ministry of Home Affairs (MHA)," he shares. This was the start of what would become an eventful journey. Chin Nam's scholarship is known as the Home Affairs Uniformed Services Local Merit Scholarship, which allows scholars to take on a career as a Senior Officer in any of the Home Affairs Uniformed Services – Singapore Police Force (SPF), Singapore Civil Defence Force (SCDF), Singapore Prison Service (SPS) or Central Narcotics Bureau (CNB). Chin Nam shares candidly that the SCDF, which he would later join, was not something he had always considered. He recounts, "It was not until my scholarship interview session with people from the different MHA departments that I was asked 'Why not SCDF?' This certainly caught me off guard, but it also made me think, 'yes, why not SCDF?'" 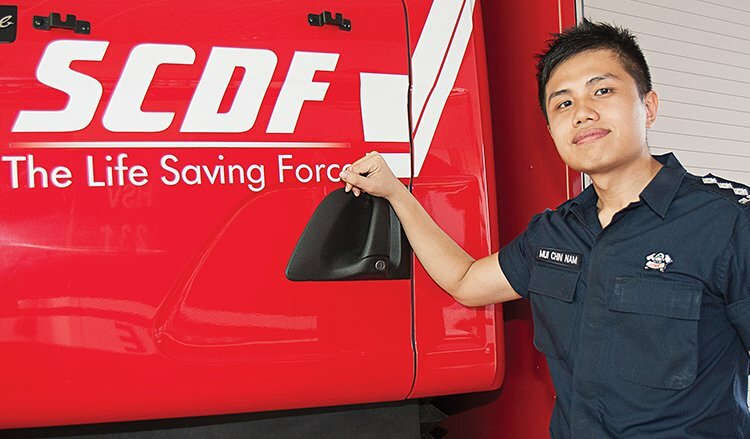 At SCDF, Chin Nam had the opportunity to serve as a Rota Commander at Tampines Fire Station. He oversaw a myriad of aspects, such as ensuring effective operational response, skills competency, personal development and training safety. On top of these critical aspects, it was then that he also fulfilled a key function of responding to fire and rescue incidents efficiently. Of this vocation, Chin Nam has no lack of stories to tell. He tells us about one particularly memorable episode he remembers, sharing, "There was this one road traffic accident in which a motorcyclist was pinned under a lorry. We used a hydraulic rescue tool and lifted the truck off him. Very fortunately, he only ended up with an injured leg despite having an entire lorry on top of him!" While his Rota Commander role has been fulfilling, Chin Nam then moved on to another department within SCDF. Today he serves as a Senior Staff Officer of IEDD Threat at SCDF HQ's HazMat department! The strength of the Home Team lies in its people. Regardless of the uniformed service that scholars choose to join, a career with the Home Team is bound to be interesting. More importantly, a Home Team career allows you the chance to protect our country, our community and our loved ones. Before embarking on a Home Team career, one must be sure that he or she has the commitment to see their challenges through. After all, the responsibility entrusted upon you is not to be taken lightly. Chin Nam firmly believes in the importance of demonstrating commitment especially in choosing a career, concluding, "Always consider your options before you set your mind on anything. Once you do, go all the way and never look back!" Liao Longchuan’s MAS Undergraduate Scholarship paved the way for her top-notch education and career opportunity in MAS. She talks about her experiences as Associate at MAS’ Financial Centre.